Taken from Juniper Moon Patterns - The Haverhill Collection: "This charming beret features an elegant cable and lace pattern that can easily be memorized with crown decreases cleverly hidden in the stitch pattern." 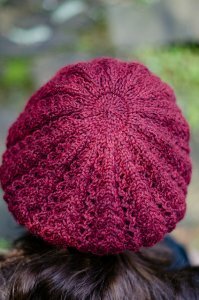 This pattern is from Juniper Moon Patterns - The Haverhill Collection - Winnekenni Beret. Size US 3 & 6- 16" circular needles and US 6 DPNs (or sizes needed to obtain gauge), tapestry needle, stitch markers, and a cable needle are required but not included. Finished Measurements: 17.5 (20.25, 21.75)" band circumference after blocking. Gauge: 22 sts & 40 rows over 4". Color Shown is #1004 Cranberry.